Once the digitizing (stitch design) is done, we'll do anything for anybody. Want bath towels? Bowling towels? Logo on Speedos? Idea--Maybe stitched on a fleece blanket, smaller one like 4x6 that could be used when sitting a round a fire or to cover the backseat or wrap around the women so she quits complaining about being cold after splashing 40 degree water in the window during a creek crossing that she refused to roll the window up for. And the limp cap idea that James had will work also. But it could say Roadie Rated! Agreed, the fleece is a great idea, and I think she has some in stock. The North Face editions like DCM owns came with a custom blanket. To get a Roadie-Rated insignia will definitely require an equipment list inspection process, along with a proof-of-offroad-use video. Teebes is the only one (so far) that qualifies for being "Roadie-Rubicon-Wingman-Rated" and "Roadie-Wheeler-Ridge-Rescue-Crew-Rated"
Maybe, let's see what he thinks. This is how it gets started. Next the topic will be a marketing plan and membership fees than onto total expenditures and the difference between gross margin and net. Give me a dollar and I can make the hat say anything you want, like "The Roadie thinks my TB is the best in the East!" Because you guys can put together 4-6 truck expeditions and we can't. I had two other local proteges, and both of them sold their lifted TBs. A couple more lifted San Diego members went silent suddenly and I don't know if they got deployed or just go out with Jeeps. I'm thinking the low density of offroading trailvoys is due to the much higher density of better-built vehicles to go with the general trail challenge level they encounter. So it's an inverse relationship. I didn't figure that. 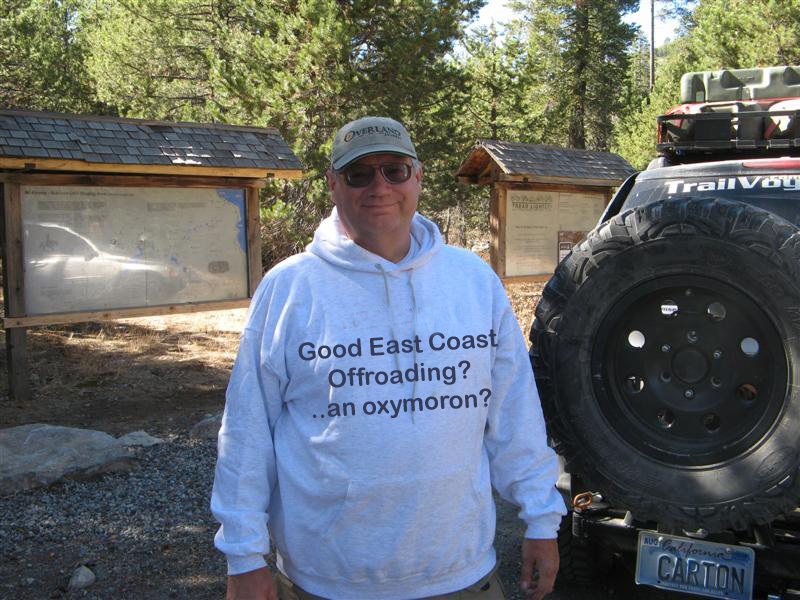 The Roadie wrote: I'm thinking the low density of offroading trailvoys is due to the much higher density of better-built vehicles to go with the general trail challenge level they encounter. So it's an inverse relationship. I didn't figure that. Hehe. He said "pork roll." I had to buy my own Boones Farm in Missouri. This being the Guest Sucker at offroad events is getting old already. At least fried SPAM lays flat when you cook it. Not like this curling-up porky roll stuff. The Roadie wrote: I had to buy my own Boones Farm in Missouri. Roadie, if I would have known that you drank Boone's Farm I would have been more than happy to dig around in my cup holder for enough change to buy you a bottle of it So, on a more positive note, I never knew you would have actually come to Missouri, with the banjo's playing and still consider drinking!!! Making me pull this out on THIS site constitutes your first warning.